His name is known to many older generation music-lovers who remember his performances as violin soloist, as a member of the Hungarian String Quartet and later of his own Végh Quartet. However, for countless young musicians Sándor Végh means much more: he is their master and mentor, and his years of experience in both playing and directing the works of past and present masters help young performers to develop a greater understanding of the depths and intricacies of their repertoire. Sándor Végh was born in 1912 in Klausenburg (Kolozsvar), the Hungarian part of Transylvania which now belongs to Romania. His parents were not professional musicians but his mother used to sing, and folk music especially was an important part of family life. At the age of six Sándor was given a violin, “Because”, he says, “that was cheaper than a piano. My parents had no idea how much money I had to save later to be able to buy a Stradivari.” From 1926 he studied violin with Jenö Hubay and composition with Zoltán Kodály at the Budapest Conservatoire. The following year, 1927, he played in a concert conducted by Richard Strauss, and having been awarded the Hubay and Reményi Prize, Végh embarked on a solo career which took him to Holland, Finland, Estonia, Bulgaria and Spain and brought him together with musicians such as Wilhelm Mengelberg, Ferenc Frecsay, Josef Krips, Istvan Kertesz and others. Sándor Végh became a close friend of Béla Bartók: “My first memories of Bartók go back to my childhood when I did not yet realize what a great influence he was to have on my life. I entered the Royal Academy of Music in Budapest and even in the corridors I could feel that he was there. He had a magnetic charisma and gave my life a direction as a human being and as a musician and I still feel this link very strongly nowadays”. In 1934 Végh founded the Hungarian String Quartet; Bartók himself gave the musicians the score of his 5th String Quartet from which they copied out the individual parts themselves. “Bartók came to our final rehearsals. He didn’t say much and never interrupted our work. But his silence was constantly accompanied by nods of approval which gave us more encouragement than praise expressed by any other listeners. At the end of the rehearsal, he came and sat next to us, said how pleased he was with our work, discussed a few details and gave us his blessing for the world premiere of the quartet at the Festival of Modern Music in Barcelona”. In 1952 Sándor Végh met Pablo Casals with whom he played chamber music and who invited him to give master classes in Zermatt, Switzerland, and to participate in the Prades Festival. This musical relationship lasted sixteen years. Sándor Végh remembers how at the beginning of their friendship, Casals once said to him “Since Ysaÿe I have never know a violinist with whom it gave me so much pleasure to play as with you. Alice Végh, married to Sándor for 53 years now, treasures a photograph of her husband and herself standing beside Pablo Casals who is sitting contentedly smoking a pipe. The dedication reads “À chère Madame Végh, avec mes meilleurs voeux et pour son mari, que j’aime. Pablo Casals.” Végh also proudly recalls how, on one occasion when he was thanking Casals for what he had learned from him, Casals said to him, “But I also learned so much from you, teaching is always a question of giving and taking”. Végh taught at the music conservatories in Basle and in Freiburg im Breisgau and he gave master-classes in Düsseldorf and later at the Mozarteum in Salzburg. In 1962 he founded his own music festival in the Italian town of Cervo on the Ligurian coast. Distinguished colleagues and friends such as Wilhelm Kempff, Annie Fischer, Elisabeth Schwarzkopf or Sviatoslav Richter were among the artists participating in the first few years. Végh was also particularly attracted to the southern coast of Cornwall, where in 1972 at Prussia Cove, not far from Penzance, he created the International Musicians Seminar on the principle that there is no substitute for master classes at the highest level for the training of professional musicians. One of the main aims of the Seminar was and still is, although Végh no longer teaches there, to keep alive the old tradition of playing which is in danger of being forgotten and neglected due to the pressures of the modern concert round and the demand for infallible accuracy as dictated by broadcasting and recording. Sándor Végh has been passing on his great wealth of experience and the Central European style of music-making to young musicians of the Camerata Academica in Salzburg for the past seventeen years now. The Camerata Academica was founded in 1951 by Bernhard Paumgartner who at the time was director of the Mozarteum Academy. With the Hungarian pianist Géza Anda the Camerata Academica recorded from 1962 the first complete edition of Mozart’s piano concertos, recordings which were highly acclaimed and received several awards. When Sándor Végh took over as artistic director in 1978, the Camerata Academica was at the point of collapse, both financially and artistically. Végh, “I dismissed all the old players, only one double-bass player remained and I had to recreate the chamber ensemble and start again from scratch”. With his new ensemble he studied the entire literature for strings and then, complemented by wind instruments, built up an extensive Mozart repertoire. Now the Camerata Academica has its own concert cycle at the Salzburg Festival and has also played in the opera pit for productions of the Mozart operas Lucio Silla (conducted by Sylvain Cambreling) and La clemenza di Tito (conducted by Gustav Kuhn). But every concert by the Camerata Academica with Sándor Végh is a festival in itself. Throughout the winter months the ensemble gives a subscription series of concerts in the Great Hall of the Mozarteum in Salzburg for which it is now almost as difficult to obtain tickets as for the series by the Vienna Philharmonic in the Vienna Musikverein. Sándor Végh does not conduct in the conventional sense of the word, he moulds and shapes the music. “A baton is a dangerous instrument”, he says, “it cuts up the music”. With his youthfully expressive face, he inspires his musicians to give the very best they can. It is an unforgettable experience to hear them play works by Mozart, full of vitality and spirit, yet never at the expense of elegance or sensitivity. And the new insights and colour Végh brings in his interpretations of symphonies by Haydn or Schubert make listeners feel they are hearing these familiar works for the first time. It is for works by Haydn, Mozart, Beethoven, Schubert that Sándor Végh and the Camerata Academica have received greatest acclaim, both in the concert hall and now also on disc, but 20th century classics - Bartók, Schoenberg, Webern and Berg - are equally important in their repertoire. “People, critics and so on, often ask me what my secret is when I conduct Mozart and I reply that I am not a Mozart specialist. A specialist only concentrates on one thing. I say a specialist is a urologist, for instance. 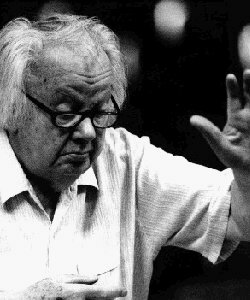 But I conduct Bartók or Beethoven or Debussy, they all come from the same source, they are all Urmusiker and their music has a great timeless quality.” In German Sándor Végh is often referred to as an Erzmusikant, the full sense of which is very difficult to convey, but it means a full-blooded musician, a musician through and through. And he conveys a certain magical, even mystical aura, “Merlinesque”, one might say, as he conjures up beautifully expressive sounds and subtle tone colours from his musicians. This article appeared for the first time in the Edinburgh Festival journal, 1997. © by Elizabeth Mortimer. Copyright © 2007–2014 by Elizabeth Mortimer. All rights reserved.